Life is simply better when you have someone along for the ride to help show you the way. Back in the spring of 2007 a friend of mine, Rob, asked if I wanted to join he and his brother on a hiking trip to the peak of Mt. Whitney. Rob is a good friend and we had been on a number of vacations together. I was up for some manly style adventure so I said sure, not really ‘sure’ what I was getting myself into at the time. Weeks and eventually months passed and our group was supposed to get together to discuss the trip. Hiking Mt. Whitney isn’t something you attempt lightly, especially not the route we were planning. Rob had a guidebook that he was getting some good ideas from and we were all throwing in our 2 bits on what works best in hiking/camping situations. At that point there appeared to be 5 of us total going on the trip; Rob, Jason, Ben, Brandon and me. Rob, and Jason were brothers and Ben was their brother-in-law. Brandon was a friend of Jason. I really only knew Rob, and felt a little out of place at first but the group was made up of first class men and they quickly made me feel at home. A little about Mt. Whitney. There are three national parks that all come together at Mt. Whitney, and based on the path we were hiking we actually had to get passes for two of the three. No matter where you are on the mountain, because it is such a popular summit, you have to have a pass to be on the trails. They limit how many people can be on the mountain at any one time. The most popular route up Whitney is the Mt. Whitney Trail. A 22 mile there and back round trip. It starts at the Whitney Portal trail head and goes up 6,100 feet to the summit and then you take the same trail back again. It’s infamous for it’s 99 switchbacks. This trail, though long and hard, can be done in a day. A 24 hour pass can be had for this express purpose. We didn’t travel that route. We wanted something more challenging. More challenging, like 4 miles of straight up scrambling. Our first night we camped at about 6,000 feet, just outside of the town of Lone Pine. Not quite as high as the trail head. The Whitney Portal trail head was just over 8,000 feet. All the campsites were reserved, so we had to stay further away, down close to the town. This turned out to be unfortunate for me, getting acclimated to the elevation was something I should have spent more time doing. We hiked all that day. Mid day we made it to a lake, I can’t remember the name. A beautifully lush area. The hike there had been fine, we had some good banter amongst ourselves and I was particularly enjoying the beautiful scenery. Truly a landscape you would see only in a few places on earth. The grandeur was breathtaking. Even though I felt quite able to make the hike, it turned out that I was the heaviest of the lot, and my backpack was nearly the heaviest. I had great shoes and terrific equipment, I simply had too much of it. Too many clothes, too much cooking gear, too much food, too much of just about everything. As we slogged higher and higher my head began to ache more and more. My stomach began to gurgle and my legs felt like lead. All of this was quite odd to me. I had run at least one 1/2 marathon in the 6 months leading up to the climb, I figured I was in decent shape. It turned out I simply was no match for the elevation and the sickness that came with it. Finally we reached the destination where we planned to drop our full backpacks and set up camp for the night: Upper Boy Scout Lake. 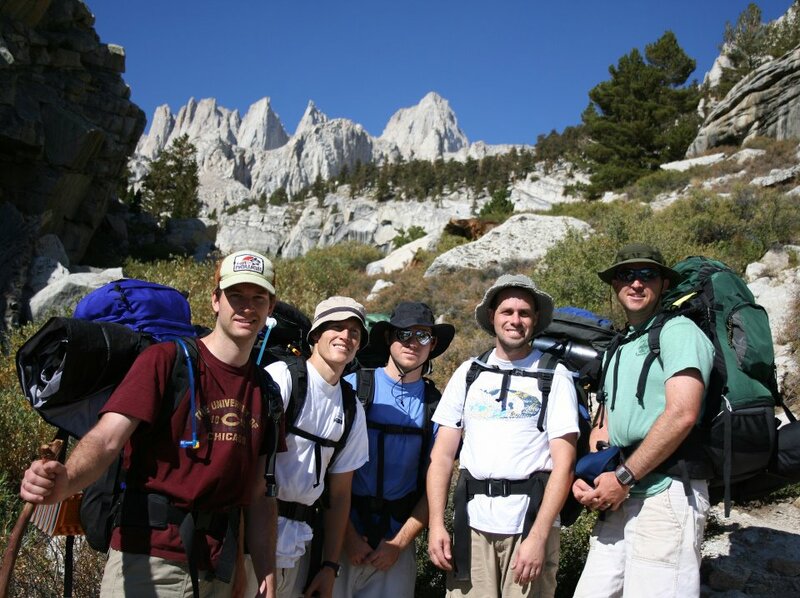 The original plan was to arrive at Upper Boy Scout lake, drop the big packs, switch to day packs and then climb to the summit that first day. Hike back down and sleep at Upper Boy Scout Lake that night. By the time we arrived at Upper Boy Scout I was really sick. I could barely keep water down, and having only eaten beef jerky and cliff bars all day didn’t help. Everyone dropped their packs and started up the rest of the way – another 1,400+ feet in elevation to climb. I just couldn’t make it. I went about 50 yards and called for Rob, I was beat and about to throw up. I said I’d stay back and set up camp. It was incredibly hard to not go with them. Mentally that is, physically it was all I could do just to make it to Upper Boy Scout lake without throwing up Cliff bars all over the trail. Having to admit I couldn’t continue on with them, that was hard. There are only a few times in my life where I couldn’t slog through to the end and this was one of them. I stayed behind and watched them hike up around the peak. Alone I set up the tent and did my best to keep the tent from blowing away. It was a bit of foreshadowing of things to come that night. After a number of hours the guys all made it back safe and sound. After dinner, we all bedded down in our way-too-big-for-a-mountain-summit tent. All five of us fit in it, covering the entire floor. Unfortunately the wind gusted all night long. The gusts must have been 50MPH plus. The tent billowed and flapped on our faces all night long. It was absolutely the worst night I’d ever had attempting to sleep. I think I may have gotten one hour straight without waking due to the tent flapping me in the face or my shoulder or back hurting from the hard granite we were bedding on. Not a good combination. Morning came and it was a beautiful day. An incredible sunrise greeted us as we emptied out of the tent. I felt much better. It was determined that I would attempt to summit alone, while they relaxed at Upper Boy Scout lake awaiting my return. I was a bit scared. The group all returned speaking of having to climb over scree, small bits of granite where if you didn’t step just right you would slide a few feet, or yards, down the mountain. As I was lacing up my shoes and about to head out Ben, from our group, said he would go with me to the base of the summit. I can’t begin to tell you how this made me feel. First of all I barely knew Ben. He had been a good travel companion and someone I’d come to appreciate as having a good head on his shoulders and a fun sense of humor. I guess I have to begin by stating the 4 men that came back were really tired and physically beat. They too had suffered from the elevation sickness, maybe more than I. They had hiked to the summit and back and had severely oxygen depleted aching muscles. Ben had even fallen and was nursing a bloody knee cap. He stated that there were a number of small climbs where he could point the way, and help me save some precious time on my way to the top. Considering his physical condition, I felt honored and incredibly grateful that he would offer to show me the way. We set out and I followed his lead. It was a bit slow, but we eventually made it to the base of the final summit. A place called Iceberg Lake at 12,700 feet elevation. At this point, Ben spent a substantial amount of time explaining to me and showing me what route I needed to take. I was looking at a number of hours more in climbing and if I’d follow his advice I would be able to find not only an easier way, but a faster one at that. Here’s a few pictures to give you a little perspective. It is taken by Ben at Iceberg Lake. The lake is out of sight, just to the right of the photographer. The large peak in the middle is Mt. Whitney. To give you an idea of the scale, on the top of that peak is flat surface about the size of 2 football fields. The guy with the red backpack is me. This is the trail that Ben told me to take. If I hadn’t taken this trail I would have spent a few more hours slogging through small granite, that was like walking on sand. It was incredibly difficult to climb on such a steep face. And where the orange line stops, 500 feet from the summit, you have to climb an icy wet ledge to the very top. I wish I’d had a helmet for the last bit. It was quite scary, but I had made it that far and I couldn’t stop, not when I was that close. At the summit I could only spend about 15 minutes. My head was swimming, my stomach churning and even laying down for a while wasn’t helping. I had to get someone to snap this picture for posterity’s sake and get back down the mountain. As I made my way back down to Upper Boy Scout lake I was so grateful for Ben. He had climbed a couple hours to help someone he barely knew, to simply point out the way. It’s been nearly two years now, and even with the passage of time I am still incredibly grateful for this gesture. I’ve often thought back on my life and the many times I’ve been blessed with someone who pointed the way. Many times I’ve followed the advice of those wiser and more traveled than I. Unfortunately though, there have been a number of times I’ve not heeded the sage who warned me of the danger ahead. 1. When going somewhere scary for the first time, take a friend who knows the way. 3. Be grateful for their help. You often can’t repay them, but a simple Thank You goes a long way.